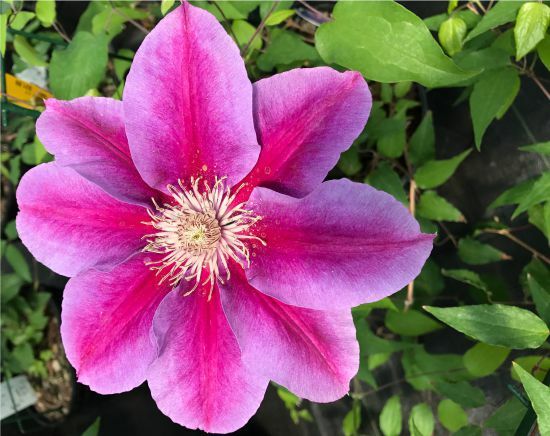 Clematis require a site that will receive at least 6 hours of sun or more per day. This helps in bud and bloom production, and in lowering susceptibility to crown rot. 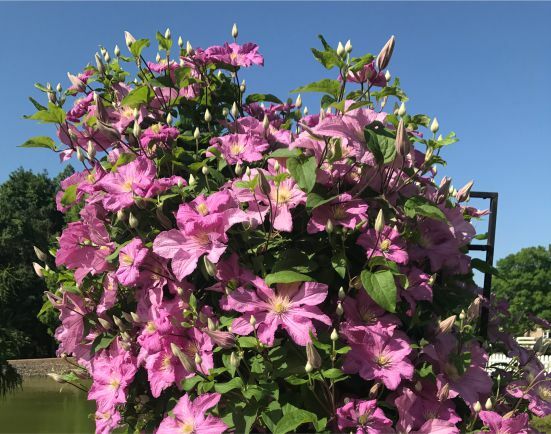 Young Clematis are extremely susceptible to crown rot, which is a disease. Crown Rot can usually be prevented by planting the Clematis in well-drained soil. Fill the hole with water several times to check for good drainage. Clematis do not like “wet feet”. Amend the soil with Sweet Peet. Create a 1:1 ratio of Sweet Peet and regular garden soil or topsoil. A pinch (1/8 cup) of 0-46-0 phosphate is also helpful to mix into the planting soil. Prune the plant back by half before planting. 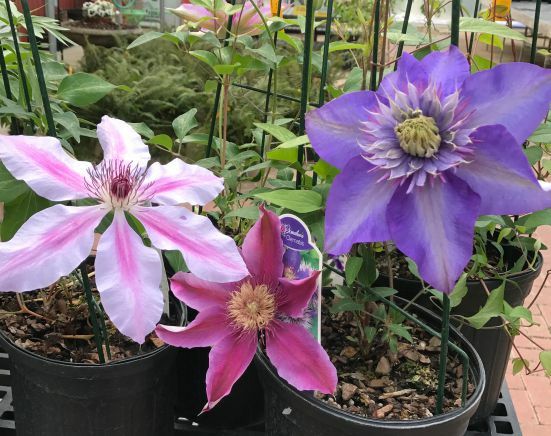 To encourage a vigorous crown, plant a Clematis at a 45-60 degree angle to the ground level about one inch deeer than the soil level in the pot. Knowing the variety you are planting is essential in order to know the proper pruning technique. Check your plant for either A, B or C and follow the pruning instructions below. Plants in this group bloom in early spring, generally in April and May, from buds produced the previous season. Prune these back as soon as possible after bloom but no later than the end of July. This allows time for new growth to produce flower buds for the next season. Remove shoots that have bloomed. Do not cut into woody trunks. Clematis are heavy feeders. After the vine is established, use fertilizer recommended for flowering plants, such as Plant-tone or a time-release fertilizer. 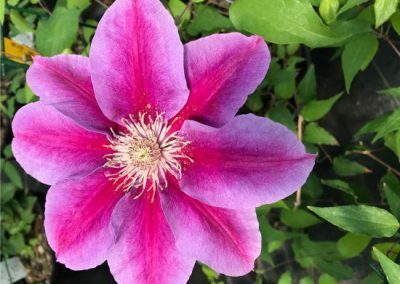 Clematis will also benefit from an annual top dress of rich compost. Choose a favorable planting site. Your site should receive about 6 hours of sun or more per day and be well-drained with a neutral pH. Select resistant plants. Small-flowered hybrids seem to be more resistant than large-flowering forms. 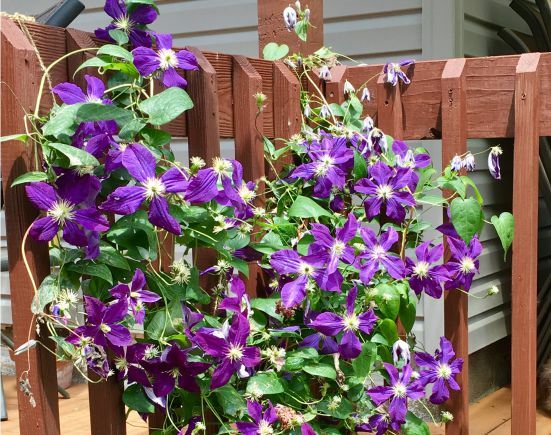 To encourage a vigorous crown, plant a Clematis at a 60 degree angle to the ground level. 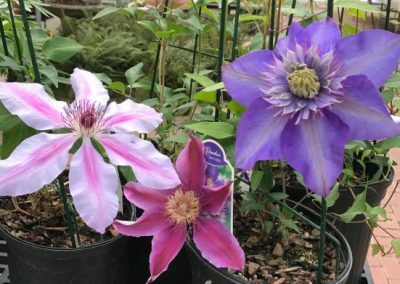 Keep the area around your Clematis free of debris all year round. Take special care to avoid injury to the stem and roots. 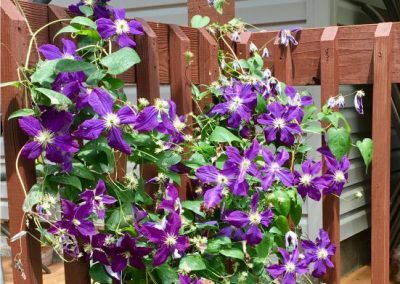 Do not cultivate near the roots of Clematis. Mulch the root system as they like to have their roots shaded. Remove diseased stems immediately. In the event that the plant becomes infected, cut the diseased stems just below ground level and destroy them.